Wait? What? Another James Wan's movie? I am buying a ticket now! Were you scared? And no, that's not the poster. Here is the poster. This film is confirmed to be a part of The Conjuring Universe. Expect to see Annabelle here. The movie starts with a family of four enjoying their picnic on a field. Suddenly one of the boys realised that his mother and brother are missing. He found their mother in a nearby stream, drowning his brother. He tries to run away but it seems that his mother manages to catch him. Then the story moves to Los Angeles in 1970s. Anna, a widowed social worker, finds that juggling between raising her two kids, Chris and Sam and her job was quite a challenge. And her boss agrees with her. When her boss assigns a case of her acquiantance, Patricia to her younger colleague, she insists on getting the case to prove her boss wrong. At Patricia' home, she finds the two boys locked in a closet with visible signs of physical abuse, althought the kids deny that it was their mother's doing. Patricia was resisting the arrest while constantly wailing 'Please keep them inside for one more night! Just one more night!' over and over again. Convinced that the boys secured under the police's care, Patricia when home. Later that night, she was called by her boss, telling her about the boys' demise - they were drowned. Taking her kids with her to the crime scene, she told Chris to watch over his sleeping sister inside the car. But kids as kids are - the more you advise them against something, the more intrigue they are to know more. While watching his mother looking at the two kids' corpses from afar, Chris heard a woman crying in the sewer. As he gets nearer to the weeping sound, he realised that the sound was not human. As he tries to run, the ghost manages to grap his hand and leaves some burn marks on his hand. Chris decides not to tell his mother or sister about the lady ghost, knowing that either will believe him. Patricia vows to let the ghost take Anna's kids so that she can see her boys again. The next day, it was Sam's turn to meet the weeping woman while trying to run after her umbrella that fall into their pool. The ghost also grab her hand and leave burn marks there too. And that night was the first night that Anna meet the weeping woman in her room. Distraught, she seek help from a priest who tells her to get assistant from an ex-priest, Rafael who know how to handle the matter of the weeping ghost. Will Anna be able to save her family from the weeping ghost? Or will Patricia be able to see her boys again by sacrificing Anna's kids? MY REVIEW Plot: 4.95/ 5.0 It was such an easy plot - a ghost wants to take everyone else's happiness as she can't have hers and a man of God will try to fail her plan. But the storytelling of this easy plot was so detailed and meticulous that you feel the need to help the family and kill the ghost yourself. Cast: 4.8/ 5.0 Well done Rich Della for such a brilliant cast - every single one did their characters justice! Will I watch it again: I will, in the cinema and at home too! The pictures are taken from IMDb and other sources on the Internet. Thank you. 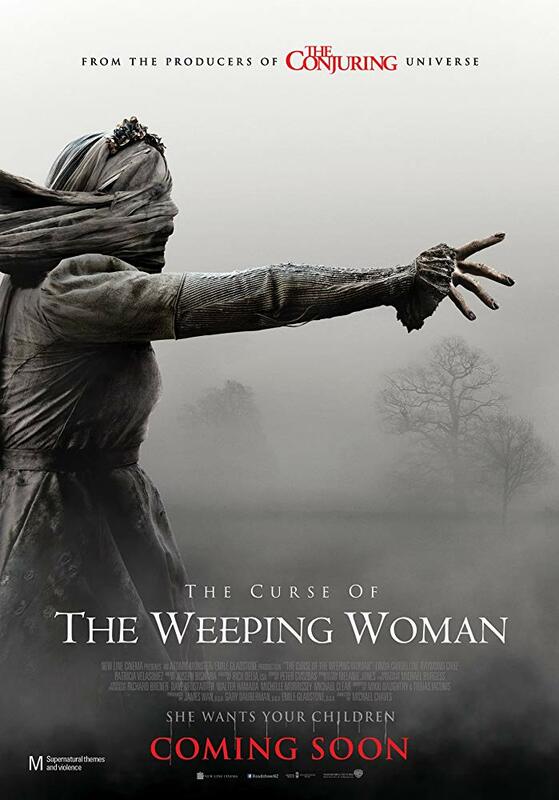 i dah dahagakan cerita2 horror movie ni hahaha..macam best jer movie weeping woman ni..nanti nak ajak bf i pergi tengok..
omg kalau baby bagi review tinggi mesti best! okay gonna be on my list . take my money!!!! Alamak, scary nya nak tengok cerita ni. Nanti balik mesti terbayang2. Dah la housemate takde ni.. Tapi tengok rawlin bagi rating tinggi jugak tu. Mesti best..
Oh man... Tgk dia punya ni pun da seram.. Lagi pulak baca cerita u..
Wow dah ada movie seram barulah. Terus rasa nak tengok trailer kat YouTube. Tapi tunggu malam nanti, baru terasa keseramannya. Aduhhh.... Citer horror gini Nina berani-berani takut nak tengok! hahaa..
Base pada review, memang ena tak berani tengok. Hahaha.. penakut kan. Nanti tidur terbayang2 plak.bagus Rawlins berani tengok movie seram. Then good writing. Boleh dijadikan rujukan peminat movie seram. Why Rawlin...? Why rawlin? Don't use those gifs...my heart sank! I want to watch it but very scared....T.T after I moved out and stay alone I takut tengok any horror movie. Bestnya tgk cite serum, kak mmg suka the, klu tgk kat panggung wayang mmg gempak sbb bunyi kuat pasti lg steam.